I got to thinking though and realized it would be fun to write a post on the pros and cons of doing deployment and pregnancy simultaneously. 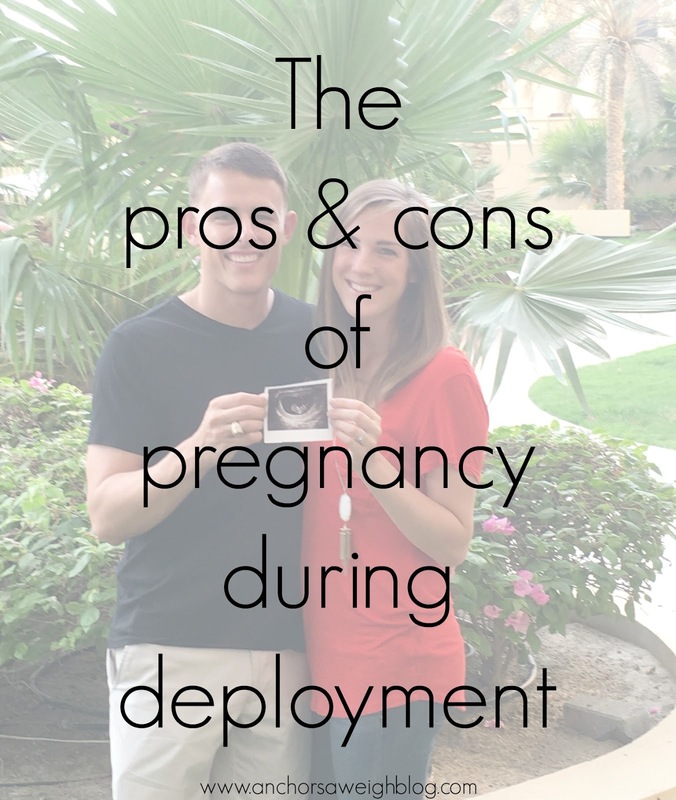 We debated this combination for a while before we decided to try, and as excited as we are and absolutely thrilled to be welcoming our sweet son, there are definitely pros and cons to choosing pregnancy during deployment. Before I begin, I do feel a little silly saying "choosing pregnancy during deployment". We had a very small window to time it and just got lucky. God blessed us with this pregnancy, and there really wasn't anything we could have done to time it so perfectly but pray and hope for the best. 1. You don't have to cook. My first trimester was rough, and not having to cook was the biggest silver lining of going through it on my own. I joked that I had an aversion to all food, but it really wasn't a joke. I couldn't stand the smell of food and wanted nothing to do with it. Cooking was out of the question, so it was nice not having anyone to cook for. 2. You don't have to focus on anyone but yourself. This sounds selfish, but if you have a rough first trimester, focusing on yourself is a full time job. It was all I could do just to feed myself. The extra laundry, making lunches, etc. would have just about killed me. Rather than being constantly aware that your husband is gone, you are instead consumed by the idea that this tiny human has taken up residence in your belly. Distractions are definitely nice when dealing with deployment! 1. The obvious: He misses everything. Seeing your husband miss ultrasounds, appointments, feeling the baby kick, etc. is tough. Pregnancy is magical (even the hard parts), and you want to share it together. 2. He could miss the birth. You could time it so perfectly that you literally get pregnant the week before he leaves, and you still may risk him not being back in time for the birth. Deployments get extended, babies come early... missing the pregnancy is one thing, but the birth is another. One of my best friends is a rockstar and had her first baby halfway through deployment. She handled it with more grace and class than I think I could have, but the birth is obviously a huge life event that you want to share with your husband if you can help it. 3. There is nobody to take care of you. Again, if you have a rough first trimester like I did, it's all you can do just to put food on a plate and eat it. Not having someone to run out and get you that McDonald's Quarter Pounder with Cheese because it's the single thing in the world that sounds halfway decent is tough. While a pro of pregnancy during deployment is not having to take care of anyone, a con is definitely not having anyone to take care of you. We've all heard the saying "there is no perfect time to have kids", and I agree. There will always be a reason not to do it or some factor that slightly complicates things. The military definitely adds its own set of considerations to the problem, but all in all, you have to decide what's best for you and your spouse and go for it. Such an interesting post! Andy and I are light-years away from having kids, but I still find myself wondering when that "perfect time" is. I'm just accepting the fact that the only perfect time is in God's time. I've been TERRIFIED of getting pregnant sooner than we had planned (in 4-5 years) but have to remind myself if God wants to give us a baby now, then He has a plan. I definitely agree with these, Kyle wasn't deployed but he was gone a lot and there are definitely pros and cons.